Get more traffic to your website and increase your flipbook’s organic search ranking by using our search engine optimization (SEO) feature. 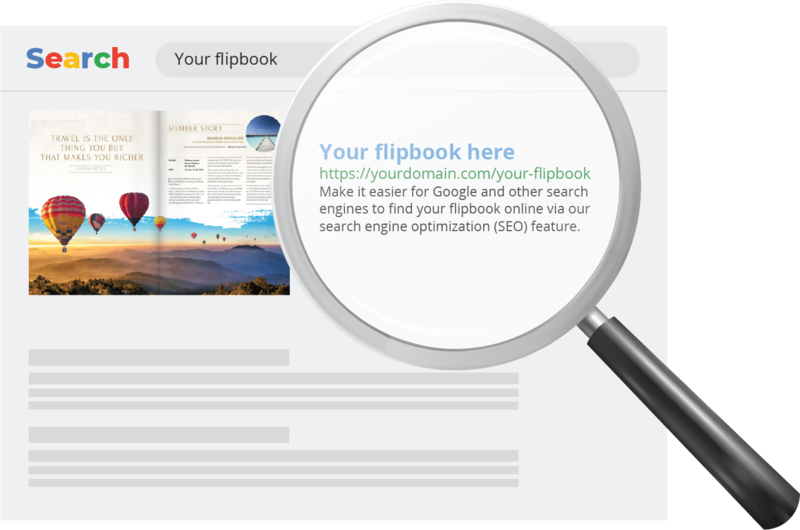 Paperturn’s flipbook system is built and designed to give your flipbooks a supercharged SEO boost - helping search engines like Google and Bing find and show your content high up on their search engine result pages. You can increase the SEO optimization of your flipbooks even further by using our SEO optimization feature included with our Paperturn Pro subscription. Ability to add META keywords, META titles and descriptions for your entire flipbook. Ability to SEO optimize individual pages within your flipbook by adding page-specific META keywords, META titles and descriptions. Ability to create a custom domain name in the URL that matches your flipbook’s content to impact the way search engines crawl your flipbook and increase its relevancy. Visit our guide and learn more about how to search engine optimize your flipbooks.